A debut goal for summer signing Alfie Beestin helped Doncaster Rovers kick off their Checkatrade Trophy campaign with victory over Mansfield Town. Riccardo Calder also found the net as a young Rovers side picked up a deserved win at Field Mill to top their group in the much criticised competition. 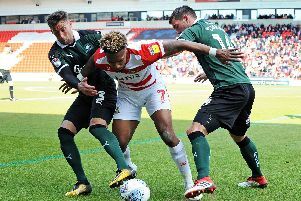 While the merits of the tournament will continue to be debated, there can be no doubt the game was a useful excerise for Darren Ferguson’s side. Injuries have left Rovers down to the bare bones. This game was a welcome reminder of what Rovers still have in reserve of their heavily depleted squad. Summer signing Beestin made an impressive debut alongside youth team graduate Reece Fielding who was precociously assured in starting at centre half. The other four faces brought into the side were more familiar with Ross Etheridge, Harry Middleton, Riccardo Calder and Liam Mandeville handed starts as Darren Ferguson used all his changes permitted by competition rules. Calder may be out of favour but provided a demonstration of what he is capable of. Constantly playing close to the touchline, he caused numerous problems with his pace and crossing. His goal to make sure of the points late on was an added bonus for the Aston Villa loanee who certainly put pressure on the regular starters. But the most pleasing aspects were the performances - particularly in the second half - of Mandeville and Beestin, operating as wide forwards in support of Andy Williams. Both were brimming with energy, producing testing runs and crafted several chances for team mates. Beestin in particular showed impressive footwork on his first introduction to Rovers supporters and looked every bit as talented, if somewhat raw, as Ferguson had hinted. It may not have been the most thrilling game of football but the positives were plentiful as Rovers maintained their momentum. The winning habit is something Rovers need this season if they are to achieve their ultimate goal of promotion. Whatever priority it given to a competition, stringing victories together is something that cannot be sniffed at. The first half, in front of a larger than expected crowd at Field Mill, was an open if scrappy affair. Rovers went close on eight minutes when Beestin embarked on a mazy run before cutting a sublime pass to Calder who smashed just wide on the angle. CJ Hamilton produced a similar effort for Mansfield while lively forward Danny Rose drilled into the side netting with a first time effort. Matty Blair struck the outside of the post with a deflected cross but Mansfield should have had the lead before the break when Rose sent a free header just wide. Rovers upped their game in the second half and looked the more dangerous. They should have been ahead on the hour when Mandeville sent in a brilliant low cross which Williams somehow failed to connect with just two yards out. But they did break the deadlock on 72 minutes. Middleton went for goal from distance but the shot was blocked, with the ball falling to Beestin who showed no hesitation in confidently smashing home from 25 yards into the bottom corner. Teenage trio Will Longbottom, Danny Amos and Joe Pugh were all sent on in the late stages. And with four minutes to go, Rovers wrapped up the win. Mandeville raced onto a Middleton pass, beat his man and squared for Calder to calmly tap in from five yards. George Taft flashed a header wide in stoppage time but Rovers kept hold of their third clean sheet in four games. And the positives were plentiful. Mansfield: Shearer, Bennett, Pearce, Howkins (Collins 59), Taft, McGuire (Hurst 43), Hemmings, Chapman, Hamilton, Baxendale (Hoban 53), D Rose. Subs not used: Jensen, Benning, M Rose, Hakeem. Rovers: Etheridge, Blair (Amos 71), Fielding, Wright, Evina, Houghton, Middleton, Calder, Beestin (Longbottom 87), Mandeville, Williams (Pugh 70). Subs not used: Marosi, Butler, Amos, Barker, James.